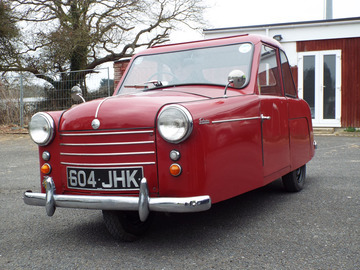 The AC Petite was a three-wheeled microcar with a rear-mounted 350 cc Villiers single cylinder, two stroke engine. The cars had a single bench seat seating two adults and was said to be capable of 50 M.P.G. (U.S.) to 60 M.P.G. (U.S.) and 40 M.P.H.. There were two versions of the car. Between 1953 and 1955 the car was fitted with a Villiers 27B engine and two different sizes of wheel, the rears were 18 inch spoked wheels while the fronts were only 8 inch. In 1955 a Mark II version was launched, this had minor changes to the exterior trim, a slightly more powerful Villiers 28B engine and 12 inch wheels both front and rear.